to find, easier to understand, and easier to use to meet a goal (or answer a question). This paper was delivered at the 55th Annual Conference of the Society for Technical Communication Philadelphia, Pennsylvania, US. Like it or not, search is here to stay. Google is not only a top brand, but a verb (“Let’s google that”). There’s even a term to describe how Google has influenced web behavior: Googlification (Lebson 2007, Klinkenberg 2008). Search: good experience or design failure? As the web grew, two schools of thought about search emerged, exemplified by the positions of usability commentators Jakob Nielsen and Jared Spool. Does search put users in charge of their own destiny? Nielsen was an early enthusiastic supporter of search. As early as 1997, his usability research showed that “more than half of all users are search dominant” preferring to “go straight for the search box when they enter a website: they are not interested in looking around the site; they are task-focused and want to find specific information as fast as possible.” (Nielsen, 1997). By 2001, he advocated that website designs should included a search box on every page. He suggested that search plays two roles: First, as a way to allow users to “control their own destiny” and make their own way to the information they are searching for. Second, as an “escape hatch when they are stuck in navigation.” (Nielsen, 2001) In other words, whether through choice or necessity, search provides an alternative to the navigation and information architecture provided by the site itself. By 2005, Google was firmly established as the leading search engine. That year, Nielsen (2005) wrote that “Users now have precise expectations for the behavior of search…Search is such a prominent part of the Web user experience that users have developed a firm mental model for how it’s supposed to work.” He defended his 2001 guidelines as “even more important with the new mental model. The dominant search engines comply with all the main usability guidelines, which is obviously a major reason that they’re on top. Today, the guidelines don’t just describe good search; they describe expected search” (Nielsen 2005). Or does search reduce the chance of success? Jared Spool’s opinion of search parallels Nielsen’s. He also reported that about half the people in his usability testing used the search engine, but that “Using an on-site search engine actually reduced the chances of success, and the difference was significant” (Spool, 1997). He maintained that one cause of this pattern of failure is that users only try one or two searches, and abandon the site if they are not successful, and concluded that “These results indicate that designers get one, possibly two chances to help users find their content with Search. If most of the users don’t find what they want in the first try, it doesn’t seem likely they will ever find it” (Spool 2001). Like Nielsen, Spool’s thinking about search hasn’t changed much, and he continues to publish articles and podcasts that suggest that Nielsen’s second use of search is the more appropriate view: that it use indicates a failure of the design and navigation on a site. There are two models for understanding search that we found useful in thinking about how to design for search. Marcia Bates’ (1999) work on how non-experts search for information led to the concept she called “berrypicking.” The idea was that searching is not a single iterative task, but a process that takes place over time. During that process, people collect pieces of information, which they collect from different sources, much as you might wander from bush to bush putting berries in a basket. information from many different sources, gathering many different kinds of facts, details and insights until they have enough information in their “basket” to make a decision. 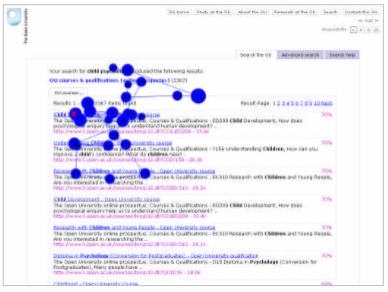 One of the more interesting models for how people search was the result of analysis that Richard Wiggins (2002) did at the University of Michigan. 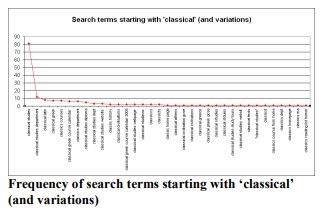 He analysed the search logs and found a standard pattern in which a very few terms made up the bulk of the searches. When graphed, the pattern shows a distinctive distribution curve with a small number of items making up a large percentage of the total. We found a similar pattern of a sharp peak, long tail and persistent themes in the Open University search logs. 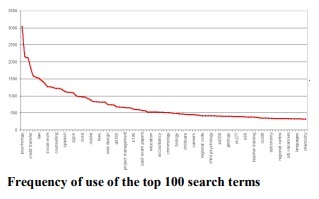 This pattern holds true even when we looked at just the top 100 search terms. It still holds true when we look at just the terms within one very small subject area, classical studies. 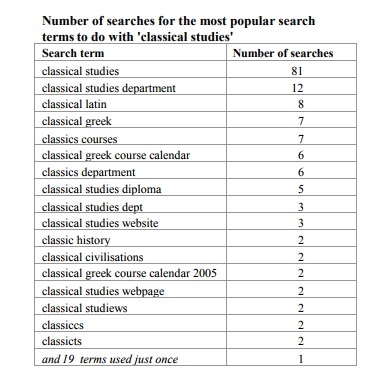 To get a better sense of the data, here’s the actual search terms starting with ‘classical’ (and spelling variations). You can see how few terms are used more than five times in a month. You can also see how the extra terms introduce little real variation: most of them are minor modifications of more popular terms. Persistent themes: the topics seen in the most popular terms recur throughout the tail (with minor variations and misspellings). Over time: themes persist from month to month. 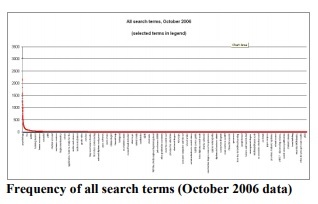 In earlier work, Whitney (Quesenbery 2003a, 2003b) identified two patterns in how people used search as part of their web experience. People used search as a launching point for a session, returning to that search page as they tried different sites in the list. In effect, they created a home page on the fly with the 10 “best bets” from across the whole web. In both of these patterns, search is embedded into the web experience, not seen as a separate activity. They turned to search when they did not see a probable link quickly, even if they had to return to a home page (where there was a search form) or do to a search page. In our analysis of search logs from external search engines, we discovered that there were a small number of “golden terms”. These are searches that are capturing users who may have had no plans at all to visit the OU. They attract those visitors to a small group of “golden pages” that offer special opportunities to capture visitors. These terms (and the pages they point to) are important because they are the unusual ones that break the “long tail” pattern. Some of them represent the hidden branding for your site, search terms for which people make a strong association. The search term “study from home” generated not only new visitors, but visitors who requested a prospectus. Others may be pages that have achieved a high rank in Google just because enough people find them useful. This means that people are visiting your site not for your primary business goals, but because there is a hidden specialty. For example, The Open University has a group of courses on writing: creative writing, writing essays and so on. The faculty website includes some resource pages that are very helpful to anyone interesting in writing. Those pages turned out to have a very high rate of registrations: people who found these resources often signed up for a complete course. This was all good news, but we also found that many of these pages were on isolated parts of the overall site. They did not have the universal navigation bar, and sometimes were not even branded as being part of the university. Even generic navigation increased the likelihood that visitors would explore more of the site; specific links to the relevant courses or departments further increased the chance that the visitor would take the next step to explore studying at the OU. 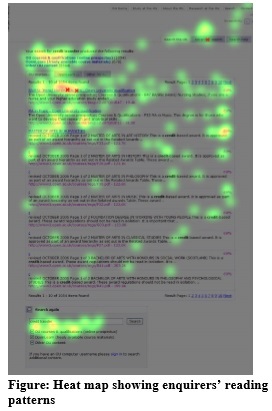 At The Open University, we used eyetracking to get a better understanding of how people read the search results pages. 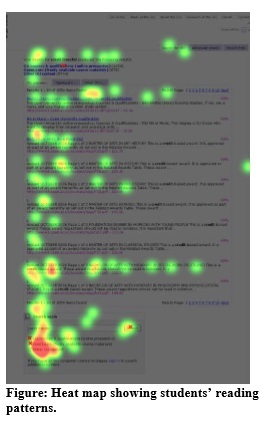 The eyetracking data confirms the observation that participants don’t look further than the first three or four hits, if they find one that seems good in that set. For example, the eyetrack below follows a student who was looking for a course about psychology of children. She glanced around the top of the page. The first fixation is on the first link. Her eyes then darted around the top of the page confirming the query “child psychology”, checking a few of the lower links, and then returning to click on the first link. There are no fixations lower on the page than the third link. We also saw differences in how students and enquirers scanned results pages when looking for information. The students were purposeful, as we might expect from frequent users of the site. They looked at all of the search results, but their eyes did not tend to wander. More than one tried the search options at the bottom of the page, and one used a link at the top to narrow their search. The enquirers’ scanning pattern was more diffuse. They looked all over the page, including the top navigation, top search options and bottom search options, but without strong direction. Some clicked on the top link, possibly hoping that it would have the information they wanted, even though the title and abstract did not indicate this. Many aspects of search are controlled by the search engine.The effectiveness of the search algorithms is one of the more important elements in determining how good the user experience is. A search engine, however, is only as good as the information in its index. Poorly written page titles, missing keywords or short descriptions, and the inclusion of inappropriate pages in the index can all undermine even the best search engine. Garbage in, garbage out. With the growing importance of search as a normal way to find information, it’s time to pay more attention to the content itself. In a search results list, people read the page titles as “headlines” (Quesenbery 2003, 2003a), scanning through them first. Only if a title is interesting do they read the rest of the description. Those titles really have to work. For example, searching for French courses, the most important thing is that they are clearly identified: courses separate from diplomas or degrees ,and the level of the course identified. Without the information that “Bon départ” is the beginners’ French course, and “Nouvel envol” the upper intermediate course, think how much harder these two search results would be to read. This is not just search engine optimization. Better titles help make any list, menu and even on general information pages. What do you “feed” your search engine? Finally, you must also decide what to index. This is especially important if your servers house RSS feeds, blogs, discussion forum archives, or photo galleries in addition to more traditional web pages. The whole panoply of Web 2.0 features introduces new complexities for search engines. At The Open University, a popular section of the website introduced RSS feeds for each of their main navigational topics. Because these files lived on the same server, the search results were overwhelmed with links to XMLbased pages. Other examples require careful thought about the purpose and audience for a website. Let’s imagine that one of the staff is an expert in a particular technology. She publishes a blog with hints and tips that others find useful. There is no proprietary information on the blog, so it is open to the public. But do you want that blog to appear in your site search results? The answer could be yes if the blog will function as a “golden page.” But you might not want this information to supersede other information about your company’s capabilities. The days when search can be treated like an isolated feature of a site are over. Search is normal behaviour, and all aspects of the search experience—the results page, how search is integrated into the site, what is indexed for search, and the content used by the search results—all need to be carefully designed.